Named after Harlan and Hazel Rogers who donated a 100 acres of farmland, the Harlan and Hazel Rogers Sports Complex is a beautiful sports and recreation venue with eleven (11) softball and baseball fields, eight (8) soccer fields, four (4) permanent concession stands and restroom facilities and a six-hundred (600) car capacity parking area. The complex hosts four Mini Major fields depicting the Yankee, Wrigley, Dodger & Fenway professional baseball parks. Softball diamonds 1 & 2 have air conditioned press boxes, new bleachers with ramps and seating for the disabled. The sports complex is used by softball, baseball, and soccer leagues from youth to adult and is host to numerous regional and state tournaments held throughout the spring, summer, and fall. The complex is the home fields for the Fort Dodge Community Schools, St. Edmonds Catholic Schools, Iowa Central Community College, Fort Dodge Baseball Association, Fort Dodge USSSA Girls Fast pitch Association, Fort Dodge Slow Pitch Association, and Fort Dodge Soccer Association. The Rogers Sports Complex is recognized as one of the best youth sports complexes in Iowa and is used by thousands of youth and adults every year. The Rogers Sports Complex has played host to the Iowa Girls High School State Softball Tournament every July since 1970. It also serves as the venue for the annual Shellabration music event that draws 5,000 to 6,000 people every summer. The Rogers Sports Complex is a major recreational asset for the Fort Dodge community. Charitable funds are used to pay for new amenities and improvements within the park. 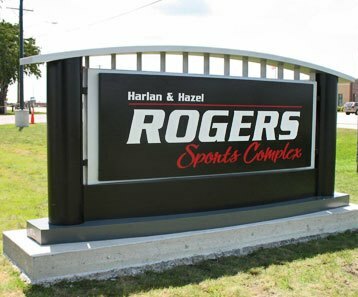 The Harlan and Hazel Rogers Sports Complex is one of the premier facilities in the state; one that not only improves the quality of life in Fort Dodge, but also leaves a lasting positive impression on visiting teams and the thousands of guests who visit the complex.